When Should I Combine Finances With My Partner? When you are in a serious relationship, you may be wondering about what you need to combine your finances. There are many steps or milestones where people may consider combining their finances like moving in together, getting engaged, getting married or having a child together. There are laws set up to protect you once you are married, and so it is best to wait until you are married to fully combine your finances. Otherwise, you may find yourself in a difficult situation and can end up being hurt financially. If you are living together, it makes sense to combine household expenses and to cover them together. The best thing to do is to set up a household budget. This budget will cover things like your rent, utilities, food and other expenses that you share. You will keep things like your car loan, insurance, and retirement separate from each other. Money that you spend on clothing and personal entertainment will also remain separate. This allows you to protect your credit, and retirement and work on the goals that you have. Since it is rare that a couple makes the same amount, it is fairer than you contribute the same percentage of your income to the household budget. So if your household budget is $2000 a month, and you make $2500 a month and your partner makes $3000 a month, you will contribute $910, and your partner will contribute $1090. This is about 36% of each individual income. You can find this by dividing your total household budget by your combined incomes to determine the percentage of your income that you should each contribute. What If You Are Engaged? Getting engaged is a big step and it shows that you are committed to each other. However, it does not offer any additional protection under the law. If you do become engaged, it is best to wait until you are married to combine your finances completely. However, if you are living together you can combine your household expenses. You may also combine some of the expenses as you prepare to move in together after you are married, such as signing a new lease. The best way to deal with this is to put all of the child-related expenses into your household budget. This includes health insurance, childcare, and clothing for the child. Then determine how much you each need to contribute in order to cover the household expenses. If you break up, you can still have help covering the expenses through child support. You will need to talk to a lawyer to set it up. Some states offer help on this through their children services department. If one of you stays home with the kids, then you need to talk about combining everything. Without the protection provided under marriage, the partner that stays home will not have any right to the retirement benefits provided. You will need to include ​retirement savings for the stay-at-home parent in the budget. It may be beneficial to consider getting married at this point. What If You Want to Buy a House Together? This can be extremely complicated. It is possible to buy a house together before you are married, but it needs to be done in a way where it is fair to both of you. You will need to draw up a contract that divides up the value of the home between the two of you. If one of you provides the down payment, then it makes sense for that person to own slightly more than fifty percent. You should visit a lawyer to have this worked out correctly so that if you decide to split up, dealing with the house will be fair and one of you will not be in a worse position financially speaking. What If Your Spouse or Partner Does Not Want to Combine? If your spouse or partner does not want to combine finances at all, you may be in a difficult situation. If you are living together, then you will need to combine household expenses. You can open up a separate checking account that you both put money in and work from there. If your partner is not willing to do that, it may be best not to live together. There may be legitimate reasons why your partner does not want to combine. For example, if you do not handle your finances well, and do not save money, he may not want to combine. However, to be fair, shared expenses should be shared. 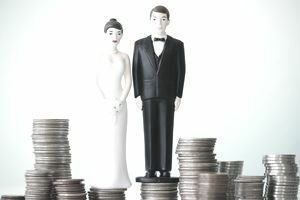 If your spouse will not combine finances, you may need to see a marriage counselor to work through the issues together. It may be a major sign that there are financial issues in your relationship.